The Stanza dei Filosofi in the Capitoline Museum in Rome is a room filled with scores of busts of famous ancient poets, orators, and philosophers. The busts have been renumbered and rearranged several times in the past three centuries. Since its arrival in the museum in 1743, the double herm of Epicurus and his placid follower Metrodorus has stood in the same place at the end of the main axis of the room. That the piece has stayed put through the centuries in remarkable, for the position is special and hence vulnerable It is a place of focus, orientation, and power. That Epicurus has occupied it against the competition of virtually the whole corpus of ancient Greek portraits speaks volumes about the magnetism of his image. This book is a study of that magnetism. It is a test of the validity of my suspicion that my own experience of overwhelming power in Epicurus’ portrait when I first saw it…was not merely a personal reaction but the response intended by the third-century B.C. artist who sculpted it and by the Epicureans who commissioned it. Ancients like Cicero’s friend Titus Pomponius Atticus and moderns like the distinguished art-historian Frederik Poulsen have described how unforgettable the portrait of Epicurus is and how strong a hold ita takes upon the minds of those who view it. My purpose in writing this book is to give a philosophical, art-historical, and sociopsychological explanation of that fascination. Of course, the fascination of a statue is not a topic about which one can sensibly write at great length, since it involves intuitive and emotional faculties that do not lend themselves to extended analysis. Most of this book is taken up with matters a good deal more mundane, which serve to prepare a secure route for approaching this elusive goal. Because the itinerary involves taking several vie tortuose, it will be well to begin by giving an overview. In the first chapter, I discuss the Epicurean school’s manner of interacting with Greek society compared to that of the other philosophical schools.Whereas the other schools form a subculture whose members’ status in the dominant culture ranges from high integration to complete alienation, the Garden of Epicurus is an alternative community under the charismatic leadership of a godlike master. In alternative communities, like the Garden, that do not recruit from within by training members’ children to perpetuate the organization, new converts must be sought from the dominant culture. Since the Epicureans imposed on themselves rules limiting contact and even communication with the world outside their school, the manner in which they could recruit members from the dominant culture is problematic. In the second chapter, I reconstruct the Epicurean policy on recruitment as a hypothetical Epicurean theorist might have done. The Epicureans faced the dilemma of how to retreat from the dominant culture while still bringing a message of salvation to mankind. I suggest that they solved this dilemma in accordance with their own theory of motivation. According to this theory, in a healthy individual perception, cognition, feeling, and motivation occur simultaneously. What we perceive, we understand and experience as pleasure or pain. If a percept is painful, we naturally try to suppress it as soon as possible. If it is pleasant, we are motivated to preserve it and to imitate it so that we become a source of pleasure to ourselves. The problem of recruitment can be viewed as the problem of motivating people to become Epicureans. Applying their own general theory to this special case should have made the Epicureans recruit by disseminating pleasing images of wisdom–that is, of the blessed and happy wise man–among as great a number of people as possible. In this way, the dilemma of recruitment could be solved by permitting the sage to perfect himself–and his image–in retreat from the world, while sending his image out into the world to do the work of recruitment for him. The solution to this dilemma creates another problem. There are obvious practical limitations on the sage’s ability to transmit his image. It cannot penetrate the physical barriers separating the Garden from the rest of the city. It cannot outlive the sage. It cannot always show the sage at his best. An artistic (or, “secondary”) image of the sage’s actual (or, “primary”) image can make up for these shortcomings by being erected in public places in the city, by surviving long after the sage’s death, and by presenting the sage to his best advantage. In the third chapter, I survey the archaeological remains of Epicurean artistic images to show that the statistics concerning the preserved portraits of ancient philosophers confirm the guess that, because of their approach to recruitment, the Epicureans commissioned far more portraits of their masters than did their competitors, whose philosophies made interaction with the dominant culture far more direct and easy. After a digression justifying use of the tabu term fetishism in analyzing Greek religion, I link the Epicureans’ use of portraits as effective means of communication and motivation to this fundamental feature of Greek popular religion. That Epicurean theology is today recognized to be a theoretical version of Greek popular religion I take as important evidence in favor of this claim. If many Greeks attributed powers of communication and motivation to statues, then the Epicureans were likely to have agreed, although they would have linked these powers to materialistic, not magical, processes. While the policy reconstructed in Chapter II gains statistical and cultural support in Chapter III, that support cannot weigh as heavily as a study of the iconology of Epicurus’ portrait. In lieu of explicit written documentation of the policy–which we are, alas, unlikely ever to recover–the best possible available evidence in favor of the reconstruction is proof that the portrait is a “sculpted word” conveying crucial messages about Epicurus’ character and mission to mankind. Before the iconology can be studied, the fragmentarily preserved ancient statue of Epicurus must be put back together and dated and its original location determined, in order to provide the hermeneutical framework for interpretation. This is the purpose of Chapter IV, in which I show that the statue was probably commissioned by the Epicurean school for public erection in Athens (near the Pompeion?) during the period 280-250 B.C. Reconstructing the lost original version of the statue takes up most of this chapter, primarily because a good deal of space must be spent on a digression in which I explain why a recent reconstruction based on an eighteenth-century engraving is wrong. My own reconstruction is based upon ancient copies of the statue that show Epicurus deep in thought and about to speak, dressed in a himation and seated on a solid-sided throne. In his left hand he holds a book-roll. The left arm rests across Epicurus’ waist, and he stretches his right hand forward toward an imaginary observer, in a gesture of teaching or greeting. 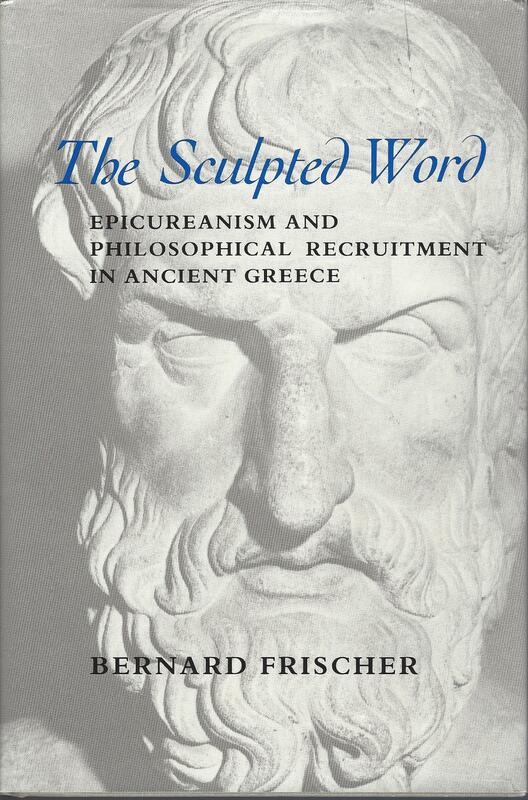 In the last chapter, the iconology of the statue is examined, with the result that Epicurus is seen to be portrayed according to the conventions of contemporary Greek art as a philosopher, father-figure, Asklepian healer, Herculean culture-bringer, megalopsychos (“great-souled” man), and god. Such a complex message could be designed into Epicurus’ portrait because its sculptor was ingeniously able to fill in details left undetermined by the requirements of one type with the details dictated by the other types. Thus, the philosopher-type dictated the clothing, coiffure, and book-roll. The father-figure determined the pose and gesture of the body. The Asklepian type inspired the expression on the face. The Herculean type governed the proportions of the head. The megalopsychic type was responsible for many, seemingly trivial, physiognomical traits. The god-type influenced the shape of the throne on which Epicurus is seated. In order to add a final degree of plausibility to my interpretation of the iconology and propagandistic function of Epicurus’ portrait, I conclude the book with discussions of late fourth-century B.C. theories of the typological presentation of character in the arts and of twentieth-century theories of conscious and unconscious motivation for renewal of the self. Both discussions are intended to show the historical and universal reasons why the Epicurean approach to recruitment is likely to have been effective in drawing to the school precisely those strangers who, upon immersion into Epicurean doctrine, were dispositionally best suited to accepting the beliefs of the school, viz., the personality-type that Jung characterized as extroverted thinking-sensation. This book is also available in a second, revised e-book from the Humanities E-Book Project of the American Council of Learned Societies.